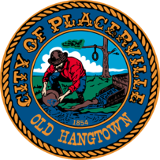 The City of Placerville General Plan is provided in electronic format (PDF) for your convenience. This electronic version may lack resolution on some pages displaying maps. A full resolution printed copy may be viewed or purchased at the City of Placerville Community Development Department, 3101 Center Street, 2nd Floor, during business hours. Click Here to download the City's complete 2008 - 2013 Housing Element, Adopted February 28, 2012 (1.5 MB). Click Here to download the Housing Strategy excerpt, containing Goals and Policies and Housing Program information. Click here to visit the Development Services Department's Housing webpage.